636 pages | 148 B/W Illus. 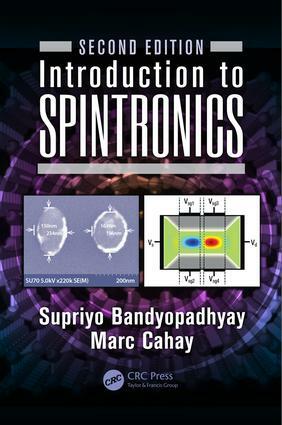 Still the only known spintronics textbook written in English, Introduction to Spintronics, Second Edition is a must read for those interested in the science and technology of storing, processing, and communicating information via the spin degree of freedom of electrons. "… a perfect, quantitative introduction to the field, with coverage of all important contemporary topics. Besides scientists and engineers working in the fields of spintronics, nanoelectronics, and quantum computing, this book will especially benefit undergraduate and beginning graduate students who have not been exposed to more rigorous training in quantum mechanics. For beginning students, the first five chapters cover the quantum mechanics of spin angular momentum, Dirac and Pauli equations, Bloch sphere, and density matrix. The rest of the book logically builds on this foundation—the authors take the reader by the hand and lead her/him through the detailed derivations from the basic expressions to the equations describing the physics of contemporary spintronic devices." "… provides a useful introduction to spintronics and nanomagnetism for beginning graduate students. The authors are well established in their field and naturally bring a technical perspective from being active in research." "The book gives a generous broad overview of spintronics. It sets off from the basic quantum mechanics needed and subsequently moves systematically to higher experts levels to make the reader comfortable with current ideas and relevant research literature in this dynamic field." "… provides sufficient knowledge and understanding in the field of spintronic devices for researchers and students in academics and industry. … I am sure this book will provide a very good platform for further development of spintronics research and education. "… amazingly comprehensive coverage … most welcome to not only those planning to but also those already working in this field of research and technology. … provides all that a novice graduate student needs to learn to rapidly attain a practical working knowledge of spintronics. Other readers of this book will gain a better understanding of the physics behind the most recent developments in spintronics." "… an elegant and logical flow among the different topics, which makes it more accessible to broad audience. Basic spin concepts illustrated by a comprehensive set of updated experimental evidences of spin effects in solid state materials are now clearly presented together with proposals for applications in quantum information processing. Overall, this is a great textbook for scientists and engineers as well as laymen, who want to familiarize themselves with this fascinating and emerging field of device physics." —Jean-Pierre Leburton, Gregory Stillman Professor of Electrical and Computer Engineering, Professor of Physics, Beckman Institute for Advanced Science& Technology, University of Illinois at Urbana-Champaign. The Spinor and the "Qubit"
Why Are the Dispersion Relations Important? Can the NAND Gate Be Switched without Dissipating Energy? Supriyo Bandyopadhyay is Commonwealth Professor in the Department of Electrical and Computer Engineering at Virginia Commonwealth University, where he directs the Quantum Device Laboratory. A Fellow of several scientific societies, Dr. Bandyopadhyay serves on the editorial boards of six international journals, and as the chair of the Technical Committee on Spintronics within the Nanotechnology Council of the Institute of Electrical and Electronics Engineers (IEEE). He previously served as the chair of the Technical Committee on Compound Semiconductor Devices within the Electron Device Society of IEEE, as an IEEE distinguished lecturer, and as a vice president of the IEEE Nanotechnology Council. Widely published, he has given more than 100 invited/keynote talks at conferences, workshops, and colloquia across four continents, and received the Distinguished Scholarship Award (the highest award for scholarship awarded to one faculty member each year) from Virginia Commonwealth University. Marc Cahay is a professor in the Department of Electrical Engineering and Computing Systems at the University of Cincinnati. Widely published and highly decorated, Professor Cahay is a Fellow of the Academy of Teaching and Learning at the University of Cincinnati, a Fellow of several scientific societies, a member of numerous editorial boards, the education chair of the Institute of Electrical and Electronics Engineers (IEEE) Nanotechnology Council, and a member of the IEEE Technical Committee on Spintronics, Nanomagnetism and Quantum Computing. He has served on the organizing committee of more than 30 international conferences, as an IEEE Nanotechnology Council and IEEE Electron Device Society distinguished lecturer, as a member of IEEE Technical Committee on Simulation and Modeling, and as the IEEE Nanotechnology Council vice-president of conference.